1 Preheat grill to medium-high. 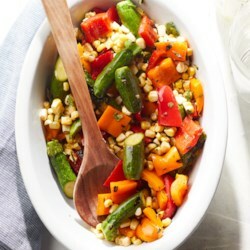 2 Toss corn, peppers and zucchini with 2 tablespoons oil, salt and pepper in a large bowl. 3 Oil the grill rack. Grill the vegetables, turning often, until lightly charred and tender, about 6 minutes for the peppers and zucchini and about 8 minutes for the corn. 4 Coarsely chop the peppers into 1-inch pieces. Cut the zucchini in half. Cut the corn kernels from the cobs. Transfer the vegetables to a serving dish. Drizzle with vinegar and oregano and the remaining 1 tablespoon oil.